n 1937 The Oversize was replaced with a streamlined version called the Senior Maxima (16 mm Wide, 139 mm Long). The unequal banded Senior met with an untimely death and was replaced with the Maxima, commonly known as the Slender Maxima, a more slender version of the Senior Maxima (14 mm Wide, 135 mm Long). The third new model was destined to become the best seller of the Vacumatic line, the Major which would replace the 3 ringed standard. 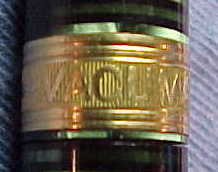 Initially the Senior Maxima and the Maxima had a 5 millimeter wide cap band with the very attractive engraving "VACUMATIC" in raised letters, these models are quite rare. The bands on the Major and Debutante models were 4 millimeter wide. 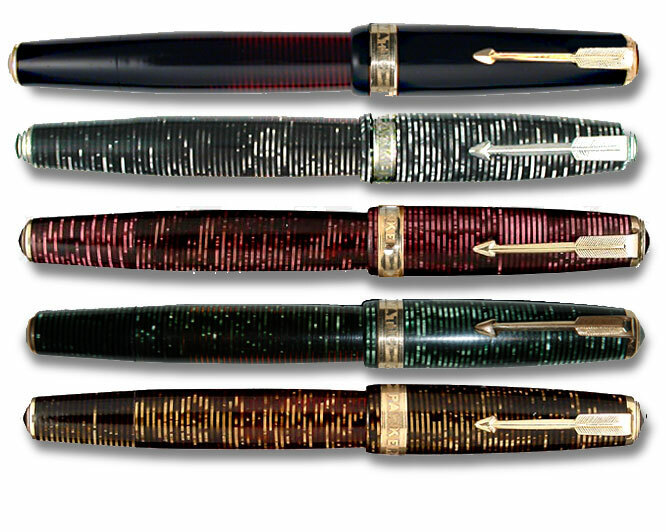 This model had a non-blue diamond Parker arrow clip, striped section and jewels, a aluminium plunger and a large 2-tone nib. ater all the bands were engraved with a chevron pattern of repeated lines leaning left and right. A pattern that stayed with the model until its discontinuation. The chevron banded maximas.